One of the best ways to interface your electronic gadgets to a computer via the parallel port is with an inexpensive build-it-yourself kit called the Kit 74. You can purchase this kit from various sources on the Internet; just search for “Kit 74” to find it. The cost of the unassembled kit is $35 or $40. You can also find fully assembled versions of the kit for about $45 or $50, and for about $20 more, you can find complete versions that are contained in a plastic case. One end of the board features a DB25 connector. To connect the Kit 74 board to a computer, you need a printer cable with a DB25 male connector on one end and a DB25 female connector on the other end. Along the long edge of the board are eight relays that can switch high-current loads, including 120 VAC circuits for lighting or small motors. The maximum current rating for these relays is 5 A at 120 VAC. Each of the connectors for the relays has three screw terminals. The terminal in the middle is for a common wire. One of the two remaining terminals is normally open; the other is normally closed. When the data pin connected to the relay goes HIGH, these two terminals reverse themselves. Because of this arrangement, you can use the relay to turn a circuit on, to turn it off, or to switch between two circuits. The Kit 74 doesn’t provide voltage for the devices that you connect to the relays, so you must do that work yourself. If you’re controlling lights or other devices that require 120 VAC, the easiest method is to cut up an inexpensive household extension cord. Using a utility knife, carefully cut through the insulation between the two wires at a convenient point along the cord. Separate the wires a bit so that you have some slack to work with; then use your wire cutters to cut through one of the wires. Strip off about 3/8″ of insulation from the two ends, and insert one end into the center terminal of one of the Kit 74 relay connectors. Finally, insert the other end into either the normally open or the normally closed terminal, depending on whether you want the relay to turn the circuit on (normally open) or to turn it off (normally closed). When your connections are secure, and you’ve checked for loose or bare wires, you can plug the male end of the extension cord into a wall outlet and then plug the lamp or other device you’re controlling into the other end of the cord. Use extreme caution when using a Kit 74 to control 120 VAC circuits! Household current is strong enough to kill you, so make sure that you don’t leave any dangerous exposed wires. Also, never work on the circuit while power is applied. One particular risk of cutting up an extension cord to connect to a Kit 74 is that the screw terminals on the relay connectors aren’t all that secure. 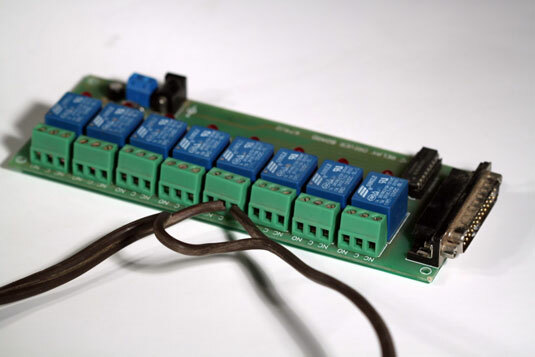 For safety, you should secure the Kit 74 to a board, and use wire holders to secure both ends of the extension cord to the board adjacent to the relay connector. This method prevents the wire from pulling out of the connector, which could create a hazardous situation.